I love this theme. Lots of space for posts. A couple of questions… Is there any way to make the the sidebars a little bit wider and is there a way to change the font color of the blog description? You can alter the spacing at the start of the theme stylesheets (style.css and print.css held in the theme directory). Under the section labelled “3 Column Layout” at the top of the css file is all you need to change. Currently it is set to a right and left column width of 150px (with 10px padding on both sides), and a center column padding of 15px both sides. Just follow the comments and you should be fine. Please excuse the value for “min-width” as that doesn’t add up properly. Also note that the print css is designed to hide both left and right columns. 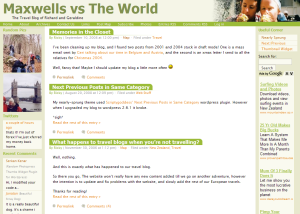 The blog description colour could be changed by adding a new css entry “#header p” and adding a ‘color’ css element to it. I’ve got the color thing fixed but honestly… I’m too stupid to change the width. I’ve change the width of the sidebars in the style.css but don’t know if I’ve done enough. I don’t know what to change in the print.css. I would like to change the left to 170 and the right to 190. Can you… Will you help? i managed to change the right and left bar width, but the centre width does not changes, resulting my left bar menu overlapping with the main page in the center. any help on how to resolve this? what else do i need to change to increased my lelt bar? I love this theme btu for some reason my sidebars aren’t showing in IE. Please help, I really dont want to use another theme. how can I remove the left side-bar. I’ll like to keep only the right one? This theme was designed to be three columns. However, you could try by changing the theme’s stylesheet to hide the left sidebar (use “display: none;” under the “#leftsidebar” in the “3 Column Layout” section). However I can’t guarantee that the website would look pretty when resized if you do that. how does one add information to the columns? The Easy way is to enable Sidebar Widgets for website, then add widgets to either sidebar. Love your theme…not very keen on word press “inner workings” but is there any way (easy way) with this theme to get sub pages to become drop down menus off the main page link in the “links” row? hi, I love the theme, just what I was after, however I’m having problems getting the Search widget to display nicely, without getting rid of the content in either sidebar. As soon as I activate it, it displays and works (hooray) but all my other content (links etc) disappears (not so hooray). Any help would be much appreciated. This theme is very nice! I am novice with wordpress and I have one question may be stupid… Is it possible to delete the links at the top of the page “Home”, “Entries RSS ” “Comments RSS “… I don’t need those links. You can remove all those options by deleting the offending lines in header.php of the theme, or turn the header off completely in the Nearly Sprung Settings page (Appearance->Nearly-Sprung).